Under a cobalt Alberta winter sky, the sound of our skis gliding along the snow-packed trail is all that breaks the stillness of a perfect winter morning. We’re skiing alongside paw prints in the snow, wondering what animal they belong to. Today my heart beats a little stronger, a little faster. Canadian Olympians call it the best place in the country to cross-country ski. Canmore Nordic Centre Provincial Park was built for the 1988 Winter Olympics and is just five minutes from the mountain town of Canmore in the front ranges of the Canadian Rockies. 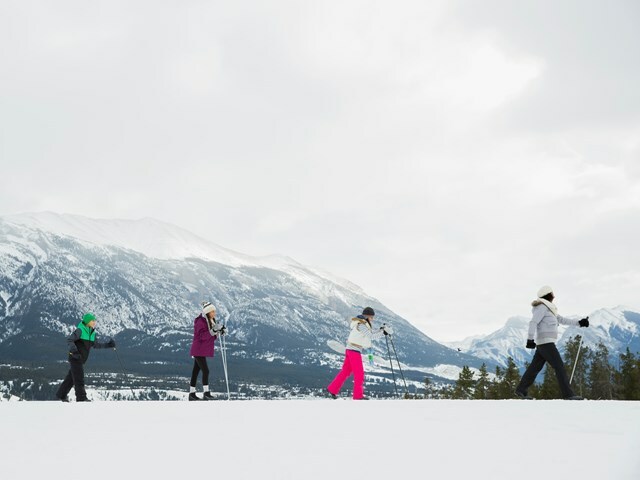 Home to Canada’s Nordic and biathlon ski teams, it has expanded from a training facility and regular stop on the World Cup circuit to a place where everyone can come out to play. And it’s less than an hour west of Calgary. There are over 65 km (40 mi) of groomed tracks and natural trails to explore. Our quiet forest trail has just opened up into a beautiful meadow and our 360° view of the surrounding mountains is beyond breathtaking. After a solid morning of skiing, the day lodge is a welcoming sight. We warmed up in front of a roaring fire and then grabbed lunch at the café. Oh and there’s a shop next door called Trail Sports where you can hire or buy any of the gear you need. You can sign up for some instruction, too. They also offer guiding services, which is a good idea if you haven’t been here before. Then next time all you’ll need is a trail map. Now we’re heading out to try some of the more challenging tracks. Maybe we’ll even spot some Olympians in training. After, we’ll drive into town for supper – so many good spots to choose from – and once we find our second wind, we’ll be back for the night skiing. They’ve lit up 6.5 km (4 mi) of trails that stay open until 9 p.m. every day. I’ve done downhill skiing at night, but never cross-country. Note to self: add to bucket list! By the way, this place is just as much fun when there’s no snow on the ground. Now, we’re talking over 100 km (62 mi) of trails that make for some of the best mountain biking in North America. You can take an easy and leisurely ride or challenge yourself on the competition single-track trails. I hear the mountain bike skills park is heaps of fun. Ever heard of disc golf? You’ll find it here, too.